Read and read again, and do not despair of help to understand the will and mind of God though you think they are fast locked up from you. Neither trouble your heads though you have not commentaries and exposition. 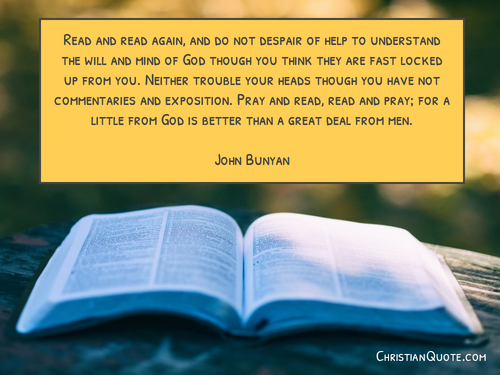 Pray and read, read and pray; for a little from God is better than a great deal from men. How blessed we are that God has given us His holy, perfect, inerrant Word that we might know Him up close and personal. God created us for relationship and there is no greater blessing than a personal relationship with God through His Son Jesus Christ.